The large increase in government debt that we are witnessing across many countries have raised questions about the adjustment that will be necessary to bring those levels back to normal. As much as the projected increases in debt are large for many governments, we have seen these high levels in the past and in some cases adjustments towards lower levels of debt have been fairly smooth and have taken place over a relatively short period of time. One of these examples is Ireland in the 1996 to 2006 period. 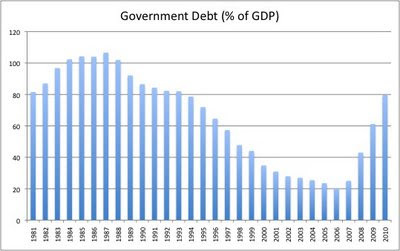 During those years government debt was reduced from over 100% of GDP to about 20%. Fiscal discipline during those years helped, but what was more important was to have a fast-growing economy that made the level of debt shrink in relation to GDP. None of the advanced economies (the US, the Euro area) will be able to replicate the growth rates of Ireland in those 10 years but the message is clear: without healthy growth, bringing down debt to GDP ratios will be impossible (and Japan is a good example of what to expect if growth does not return). The Irish example is also a reminder of how important is to have a proper framework for long-term sustainability of public finances. While the reduction of the debt levels was very impressive, some of the contributing factors were of a cyclical nature but they were judged to be structural by the policy makers. Once the cycle changed and the surpluses turned into large deficits, debt levels increased and, in the case of Ireland, we are witnessing a return to the high levels of the early 90s. 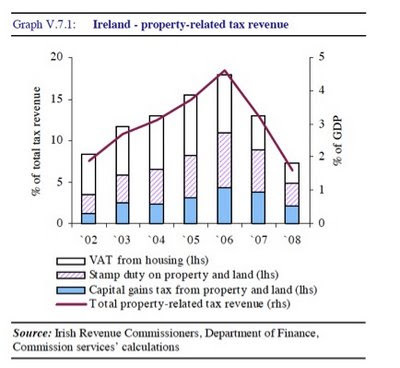 As an example of how cyclical factors helped during those years, the chart below - from the Public Finances 2009 publication of the European Commission - shows how dependent the increase in taxes was on the boom in property taxes. At the peak in the real estate boom, property-related taxes accounted for close to 20% of all tax revenues. In 2008 they have gone down to 10%, a loss of about 3 percentage points of GDP. Ireland is not the only country that is suffering from this problem. Overoptimistic scenarios used during the expansion phase did not produce the necessary fiscal discipline that could have created the necessary space for the current fiscal expansion. Let's hope we get this right in the next expansion (whenever it starts). An update to our previous post. Below is a chart from the blog Calculated Risk that makes clear how difficult is to judge the effectiveness of economic policies. 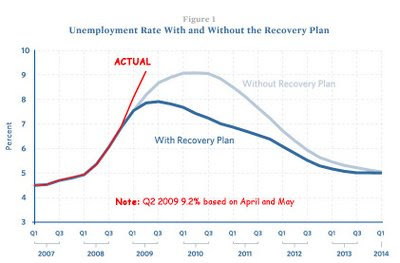 The two blue lines show the projections made by the Obama administration on January 10th for the evolution of the unemployment rate with and without the implementation of the recover plan. The difference between the two was a measure of the expected positive effects of such a plan. The red line shows the actual behavior of unemployment, much worse than any of the two predictions. A failure of the recovery plan or the fact that things have gotten much worse than what we expected in January? What are the effects of the monetary policy actions that central banks around the world have taken since the start of the crisis? How many jobs will be "saved or created" by the stimulus packages put forward by governments? These are crucial questions for policy makers but they are also very difficult to answer. The only way to provide a proper answer to these questions is by building a counterfactual: "what if those actions had not happened?". Easy to say, very difficult to do (at least in a credible manner). This leads to very interesting debates and, in some cases, confusion. "If the "saved or created" formula looks brilliant, it's only because Mr. Obama and his team are not being called on their claims. And don't expect much to change. So long as the news continues to repeat the administration's line that the stimulus has already "saved or created" 150,000 jobs over a time period when the U.S. economy suffered an overall job loss 10 times that number, the White House would be insane to give up a formula that allows them to spin job losses into jobs saved." I agree that it is difficult to hold governments accountable when we do not have a clear baseline on what would have happened without their actions, but this issue does not just apply to the Obama administration or to the "saved and created" formula. Even if we were in a period of job growth, any claim on "jobs created" would also have to be judged in relation to what would have happened if policies had been different. So whether politicians talk about "jobs created" or "jobs saved", we always need to question the assumptions in their economic projections. Much of the empirical research in economics is about designing tests that can allow us to build counterfactuals and measure the true effects of policy actions. But in most cases this requires the use of historical time series and bundling together many episodes. And then the difficulty is to extrapolate what we learn from those historical episodes and see whether their lessons apply to the current scenario. As an example, our research might tell us that fiscal expansions have had in the past positive effects on output and employment and we can quantify those effects. But circumstances are always changing and it could be that under the current economic conditions those effects will be smaller or larger. As much as we have historical data on similar episodes, each episode is different from the previous one and it is impossible to control for all relevant factors. Having said that, this is not an excuse that can justify any claim on the number of "jobs created or saved". Baseline scenarios and counterfactuals can be built even if they are uncertain, and they should always be used to judge the impact of economic policies - in bad times and in good times. I attended today a very interesting conference on the role of fiscal policy at the IMF. I presented a paper on the role of automatic stabilizers. It is interesting that there are very few academic papers that have looked into the effectiveness of automatic stabilizers. In my paper I argue that the evidence suggests that automatic stabilizers are effective and should not be ignored. I also find that in recent years countries with smaller automatic stabilizers have compensated with more aggressive discretionary fiscal policy (e.g. the US has smaller automatic stabilizers than Europe but in the current crisis has used discretionary fiscal policy more aggressively). The program of the conference and copies of the papers can be found at the IMF web site. If the link above stops working, you can find a copy of my presentation here.